'I suppose you'll want to go to the ruins again?' said Gina. Gina's black bob glinted gold in the September sun. She shrugged, but turned left all the same, down Dundonald Road, past the terraced houses, towards the 'ruins'. Charlie sighed. The ruined church and school stood tall and skeletal at the bottom of the street - first the school, then, across the old railway, the church. They clumped through the weeds. A wasp attacked Jack's white shirt. He brushed it off, but it shot straight back and settled on his tie, mesmerised, it seemed, by its silver and red diagonal stripes and the sky-blue, upturned sword of the Didsbury High School badge. Charlie led the way, across the playground - the school's broken towers and cracked, pointed windows to his right. Then came five stone steps and the underground passage - a cigar-shaped air raid shelter - below the thorns and thistles of the disused Manchester to Stockport line. The floor clanged, as the chipped tin of the walls and ceiling mirrored their passing in a blur of grey and black. How different, Charlie recalled, from that sparkly May morning when the reflections had galloped by like the Horses of the Sun, the dull sheen set aglow by seven sacred candles, as Charlie guided his company through the tunnel and into the church to find and save the Holy Grail. He had Jack and Gina with him then, of course, plus Billy, Paul and Christina, as well as Adam, who had been the first to go just after half-term. Soon, bar Jack and Gina, they had all gone, heads turned by music, make up and clothes. They were the only two left now, and not for much longer by the look of things. Still, Charlie felt hope. He had a plan. Five steps up brought them to the church forecourt and the twin steeples. He bore left, past the Great Tower and the South Transept's crumbling brick, to the back of the church and an ivy-clad door. He knew what he would do - take them up the Lesser Tower to the roofless chapel, where the sun would shimmer on the faded frescoes, shocking Jack and Gina out of their grown-up play world, bringing back to themselves and the great myth that Charlie had inspired them (and himself) with ever since the monks of Saint Michael's School and Church had shut their mysterious doors. Why those doors had closed remained largely unexplained, even now, two years on. The grown-ups huffed and puffed, but no-one seemed sure of anything. Different people said different things. Charlie reckoned that the Holy Grail had been hidden in the church. Dark powers were hunting it down. His dad said that the monks, who were called Constantinians, had simply ran out of money, while Fatty Holloway claimed they had been busted by MI5 for plotting to overthrow the governments of Europe and restore the Roman Empire. But the few ex-St. Mike's kids who had been sent to Didsbury High (most had gone to St. Mark's, the other Catholic school) just smiled and shook their heads at the juicy tale. The monks were strict, but nice, they said, and Charlie could get nothing more out of them. Like everything else about the place, it was all very strange. Light cascaded in, every ten steps, through thin slits of windows along a spiral stone staircase. 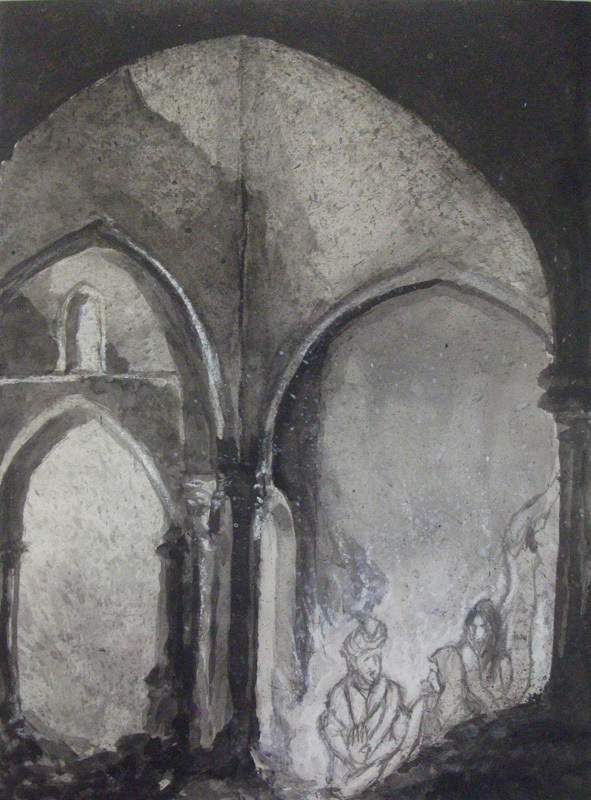 the roofless chapel, once they arrived, was the same as ever - a round stone chamber, with a bare altar in the middle, three glassless windows behind, and a gaping, jagged hole at the top. The sun crashed through, as Charlie had hoped, slashing down and around the altar in a halo of arrowed light. The frescoes glittered and throbbed with vitality - numinous, transfigured - poised, it appeared, to spring from the walls and take 3D shape in the room - a ship, a crowned king, a rearing horse, three winged angels, and a burnished, fire-flecked chalice. The scene was gorgeous - heart-stoppingly so - but Jack and Gina paid no heed, loping listlessly around instead, Jack to Charlie's left and Gina to his right. The wasp flew from jack's tie and vanished through the middle window. Charlie watched it go. Then Gina said, 'I'm sorry, Charlie. This is the last time. We can't come any more.' He turned to her, but Gina shook her head and looked away, towards the king on the wall and his sceptre and orb. Charlie gasped, stopped listening, blinked, rubbed his eyes, and blinked again. He couldn't believe what he was seeing. A girl was standing in the doorway, right in front of him, tall with long brown hair and dressed in dazzling white. She held a lit candle, with purple letters looping around, forming words in a foreign language - Latin, perhaps - that Charlie couldn't understand. He glanced down, muddled and shy, and when he looked up she was walking straight towards him. He tumbled back, panicked, tripped over and fell, scrambling to his knees to see the girl in white already behind the altar, standing on the right-hand side, holding her candle aloft. Charlie buried his face in his hands, peeping through his fingers. The girl bowed low, but not to him. He turned around and saw a new girl, smaller than the first, her hair as black as Gina's, but with a rounder, more childlike face. She wore a scarlet robe and carried a big book with a golden cover - a red cross emblazoned on one side and a soaring eagle on the other. She walked forward, carrying her book before her, and stood behind the altar to the left. Both girls bowed. Charlie turned again, and there, standing on the threshold, was a woman in blue, the tallest woman (or man) he had ever seen - seven foot at least - with a face he couldn't see, because in her hands was the Grail itself, blazing like a thousand suns, filling the chapel, and both Charlie's worlds - the mythic and the real - with healing, hallowed light. A song began - holy, high and wild. Charlie looked up. It was the girl with the book. The woman in blue was in front of the altar now, a yard or so away. Her hair was black and streaming, flowing half-way down her back. The singing stopped. She lifted the Grail up high. Charlie closed his eyes, and a bell rang three times. When he came to, Jack and Gina were the only people there, standing by the left-hand window, looking down at the railway and school. 'Did you see? Did you see?' Charlie spluttered, shaking them by the shoulders. 'Please Charlie,' said Gina. 'Let it go.' She stretched out her hand, but Charlie wrenched it away and ran off, across the threshold and down the stairs. At the bottom he spotted another staircase - one he'd never seen before - spiralling down to the right of the door. He raced down the steps, hope restored. Hammer-hammer-hammer went Charlie's heart. 'This is it,' he thought. 'The book, the candle, the girls, the Grail.' But when the stairs ended none of them were there. He was in a round chamber again, the same size and shape as the roofless chapel. A burning brazier, high to his left, lit the room, evocatively exposing, in red and yellow tongues of fire, the painting hanging on the wall to his right. Charlie walked across, then stumbled two steps back, stunned by an unsuspected force and power. It was a portrait of an old man. He had a red cape, a shock of white hair, and a face that struck Charlie as wise and kindly, yet also forceful and strong. It was a face of experience and depth - a noble face, a royal face - a face, Charlie felt instantly sure, of one like him, who had searched for the Grail when young, found it, lost it, and set out after it again and again, a man who had suffered and lost but never surrendered, a man who had wrestled with angels and flung back everything the world could hurl at him - highs and lows, ups and downs, twists and turns, all of that - and won through. Charlie saw it in the bright blue steel of his eye - passion, pride, commitment, integrity, service - everything he needed and yearned for to give shape and direction to the mess of his own life. He wondered who the old man was. A saint? A monk? Or the Emperor himself - Constantine the Great - who, so Fatty claimed, the monks had name their order after? Whoever he was, and despite the years between them, Charlie felt a connection and kinship, a bond and deep affinity - like they were living at the same time, sharing the same journey, and bearing the same load - brothers, comrades and friends. He sat on the ground, drew his knees up to his chin and reflected on his troubles. No-one understood him. Parents, teachers, mates, no-one. Except old Hanrahan, of course, but that had been years ago and Hanrahan was no longer his teacher. But, then again, Hanrahan had never really been a teacher, not in the way that Edmonds and Handysides and all those bores were. He was an Irishman and a storyteller, who had given Charlie the myths, legends, songs and stories - from Cuchulain to Lancelot, to Heracles, Jason and Odysseus - that electrified his mind and transformed the daily round of home and school from black and white to colour. It wasn't Hanrahan's fault that Charlie had pushed too far, like Icarus floundering in the air or Phaeton tussling vainly with the Horses of the Sun. Roping in his friends, Charlie realised now, and trying to make the legends real had made him all too easy prey for the great wave of change sweeping their childhoods away. His friends had found it a laugh at the start, so much so that Charlie thought his Company might last forever, but virtually overnight, once everyone turned thirteen, they all lost interest and drifted away. They didn't care like Charlie did. They were cut from a less intense cloth. They didn't have his desire, his hunger, and his mad, undying hope that one day he'd head out for school and burst straight through the screen of surface appearance into a realer, deeper, truer world - through the magic forest to the Grail Castle and out the other side, across the Western Sea with Gina to the Isle of Heroes where the Holy Ones dwelt in the hallowed, healing light of God. Charlie stood up and stared into the old man's eyes, his folly laid bare and his silly schemes smashed. But in the steady stillness of that gaze, second by second, then minute by minute, a new strength dawned and shone within. This dynamic, kinglike face, he perceived, was offering him so much - the brotherhood he longed for, the guidance he needed in his voyage from boy to man, and, most terrifically of all, a sign and prophecy of what he might one day become if he dug down deep inside and tuned into what was real, in himself and in the world outside. A buzzing noise distracted Charlie. He looked around, but couldn't see where it was coming from. And in that moment he saw a truth - that there was no division, no clash, no threshold even, between the real and mythic worlds. They were the same. One and indivisible. And that, Charlie recognised, was the old man's parting message - that if he learned to trust and listen, learned to trust and listen, learned to touch, taste, hear, smell and see things as they really were - not as he hoped or feared they were - then this fuzzy world, this world of fumbles and frustration, would flip around in a numinous flash - as holy, high and heart-stoppingly gorgeous as the frescoes on the wall - the ship, the king, the horse, the angels, and the burnished, fire-flecked chalice. The buzzing was bugging Charlie now. This time he clocked the culprit. It was the wasp, whizzing around the top of the frame. Charlie stretched out his hand, but the wasp backed off and disappeared into a crack behind the painting. Charlie smiled. The brazier crackled behind him. It was time he went back upstairs. He bowed low to the old man, said 'thank you', and turned to go. And as he left, high above somewhere, faint and far off - in another world, perhaps - a bell rang three times.